Brenda met Costa on the first One Person trip (2008). His parents fled a Tutsis' massacre in 1959 and Costa was brought up in Burundi and the Democratic Republic of Congo. His wife, Bernadette, saw her parents and siblings killed in the 1994 genocide and survived by hiding in the ceiling of a neighbor’s home. Costa was a member of the Rebel Resistance Army that helped to overthrow the Hutu regime and he has been imprisoned three times. He documents his extraordinary life in his book The Work That Brings Peace In Me. Costa is committed to healing himself, his family and his homeland, he travels the world promoting peace and reconciliation, and has visited with us in British Columbia. He now lives and studies in Maine, USA. Costa is part of TRO (Terimbere Rwanda Organization, formally known as GO Rwanda.) the organization that received our first shipping container. TRO works in the Muhunga region to implement a genocide reconciliation project, which supports genocide survivors through community reconciliation and rehabilitation programs. Perpetrators also undergo rehabilitation and receive counselling before they are paired with a survivor to build homes for vulnerable families. In a previous visit Brenda and a team of volunteers had helped to make bricks for one house, and now our team had the opportunity to do the same. Rwanda is called The Land of a Thousand Hills, and I'm sure that we hiked most of them on this trip! "Today we hopped back on a bus to Muhanga and then walked down the side of a mountain to a house where we were invited to make mud bricks to help the family that needed them. Since we are volunteers we made around 150 bricks for free, the family was very thankful because when they pay someone to make the bricks it costs 25 RWF per brick. 150 bricks isn’t a lot, and when I roughly counted the bricks of the houses around us, I figured that we probably only made enough bricks for a quarter of a quarter of the walls. But helping the family save around 3750 RWF was a good feeling since they could now use that money to buy a goat or something else for the house. The bricks are literally made out of dirt and water. They start by pouring water onto the dirt and then they use their feet to squish the water around, making the ground wet enough for them to throw it into a square mold for the bricks. The men making the mud held tools that looked like bent shovels to pound into the ground to break up the mud, roots, grass and rocks from each other. Then they rolled up the mud into a medium sized ball and passed it to the person next to them who then passed it to a few more people before it ended up into the concrete molds where Brenda and another man squished it around to make a perfect square brick with no air holes. It was a great experience but I know that the people there were just doing it so we would be happy...and I know that they could have done it ten times faster than the silly mzungu’s did." Evariste, the house owner, digs and prepares the mud. Brenda and One Person Director and co-founder Sheena work with Evariste and his family and neighbours. Evariste Nsengiyumva moved to Muhanga in 1996 from the then dangerous Congolese border. It took him eleven years to acquire his own land and he has finally saved enough money to begin building his family home. Opportunities raised funds to help us get our Muhanga shipping container out of customs storage when it was held for far longer than expected. The house was about three quarters finished. Families pay to have bricks made and build as they go - sometimes it may take years to build a small house. As usual - we had an audience. Erin shows the children their photograph. Erin helped teach in out Train The Teachers week in Tanzania on this trip. Her school, Holy Cross, in Penticton, B.C. donated books to St. Timothy's school in Moshi, Tanzania in 2011 (Bart had asked One Person to make a donation there in return for their raising extra funds to help get the shipping container out of storage) so she travelled to St. Timothy's to meet the staff and children. Holy Cross is giving the school long-term support. The government encourages people to not build the traditional small grass-thatched huts (Nyakasi) but to build larger homes with tin or tiled roofs. 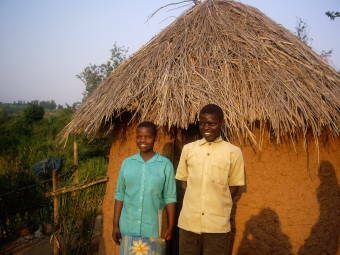 In 2006 (as a World Vision Volunteer) Brenda met this brother and sister who were orphaned after the genocide. They live in a remote area in a traditional grass hut. They told Brenda that in the rainy season, which lasts three months, they had to try and sleep standing up as the roof leaked and the dirt floor became a muddy pool. It was very satisfying to take part in the brick making and work side by side with the villagers. Costa had been delayed returning from a trip so we were only at the village for part of a day, rather than the three days we had planned, so our contribution may not have made a massive difference to the progress of the walls in the house but by going back year after year and helping to build other houses in the community we are showing our commitment to our long-term involvement with Muhanga.